The Flame Skimmer Dragonfly is a marvelous species of dragonfly known by the scientific name Libellula saturata. They have bright colors to display, along with their simple designs, making them truly amazing. Their naiad form is different then most dragonflies, but they still grow up to be fast, ordinary dragonflies. 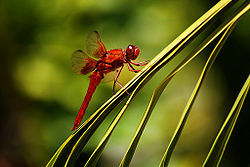 This dragonfly looks like a little flame as its bright orange coat rushes by. Naiads live in the mud of warm, moist places such as hot springs, and some ponds in the southern part of the United States. They do not chase after prey, instead they hide, and wait for prey to pass by. This method is also used for protection, as predators would chase after them if they left their hiding spot. They usually hide behind twigs and rocks. A typical naiad's diet consists of mosquito larvae, small fish, tadpoles, aquatic fly larvae, and freshwater shrimp. Adult Flame Skimmers usually feed on moths, ants, flying ants, flies, termites, and other soft insects. They only like to fly if the weather is warm, usually, 65 degrees Celsius at the least. When it is very wet or cold, they will hide by plants and trees. 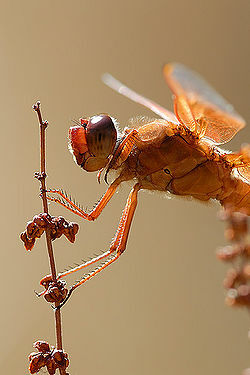 Most dragonflies live as naiads underwater throughout the winter, but few might migrate south to a warmer location. Map of flame skimmer habitats in the USA. Like most dragonflies, the flame skimmer loves warm climates. Anywhere where the weather is about 70 degrees or warmer is fine for them. They are usually located in the southern half of the United States, around southwestern Idaho, southern California, Wyoming, and other southern United States. You will find the naiads in ponds, streams, and other freshwater locations, and they can remain there for several years before becoming adults. You will usually find a large amount of naiads in ponds during the winter, as they only become adults in spring or summer, and they wont be very active due to the cold. Unfortunately the adults don't usually live through the winter months, so you will rarely see them around during this season. Flame Skimmer Bio By Mark Lung and Stefan Sommer, Digital Atlas of Idaho, 2001. This page was last modified on 28 July 2014, at 12:34.